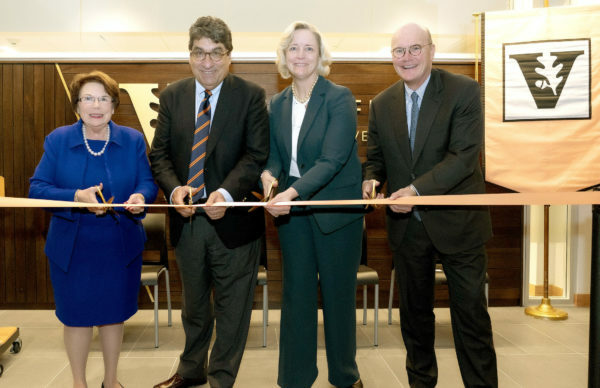 Vanderbilt University School of Nursing opened a new $23.6 million building expansion containing a state-of-the-art simulation lab, technologically advanced classrooms and student services offices with a grand opening and ribbon cutting event on Jan. 22. The high-tech building also features wellness components designed to support occupants’ well-being in health and comfort. 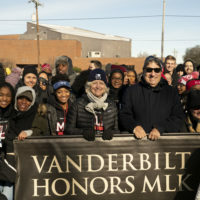 Speaking to guests that included health care leaders, federal and state officials, donors, university leadership, students, faculty and staff, Vanderbilt University Chancellor Nicholas S. Zeppos noted the ways in which the expansion reflects Vanderbilt’s approach to the field of nursing. As part of its focus on well-being, the building incorporates natural lighting, improved air quality, a rooftop green space and open staircases with wide landings. It was constructed to meet LEED Gold certification and rigorous WELL Building Standard requirements that consider a structure’s impact on its occupants in the areas of air, water, nourishment, light, fitness, comfort and mind. 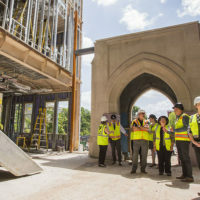 The university will apply for WELL Silver certification and anticipates that it will be Nashville’s first building designed from the ground-up to be WELL-certified. The Simulation and Skills Lab fills the building’s third floor, and the technologically sophisticated teaching/learning space contains advanced equipment and 13 patient care bays that can be used for emergency, obstetrics, pediatric, bedside, practitioner office or neonatal nursery settings. 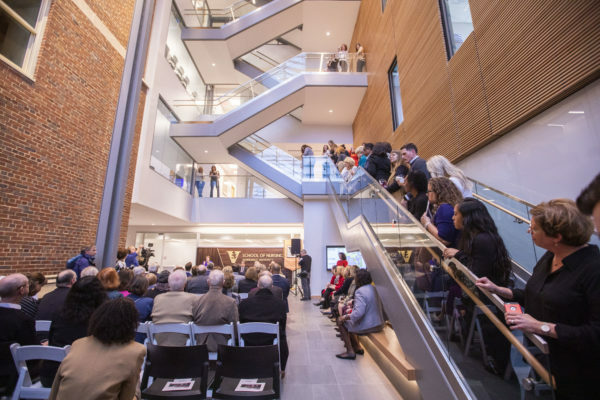 Vanderbilt Board of Trust Chairman Bruce Evans was impressed at how the building incorporates technology and innovation. 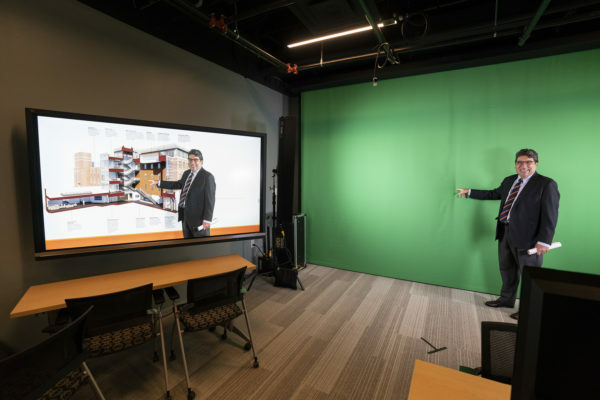 In addition to advanced technology in the Simulation Lab, the building includes a virtual classroom and sophisticated interactive classroom. Other technology-advanced class/seminar rooms in the building include the elegant fifth-floor Christy-Houston Foundation, Inc. Conference Room, second floor Holeman Reynolds Conference Room and the Agnes K. Godchaux Conference Room, which serves the third-floor Simulation Lab. The fifth floor also contains the Sandra Coats Chase Terrace, an open-air green space that adds to the building’s wellness components. Other wellness aspects include natural lighting that supports human circadian rhythms with optimum light intensity for at least four hours a day, an open staircase with wide landings that encourage low-impact and moderate-to-vigorous stair climbing, ceiling tiles in the classrooms that soften sound reverberation, and the deliberate incorporation of nature with a landscaped open space in front of the building. The colors, textures, patterns and materials used in the expansion have been selected to reflect nature and connect people with natural surroundings. 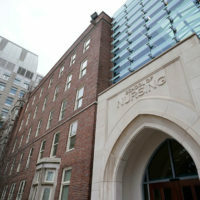 The Vanderbilt School of Nursing is located at 461 21st Ave. South in Nashville. The 29,947-square-foot building was designed by Hastings Architecture and the construction manager was D.F. Chase. WELL is administered and certified by the International WELL Building Institute. IWBI works with Green Business Certification Inc., the same organization that administers LEED certification, to oversee WELL certification. The building evaluation will be carried out by Green Business Certification Inc. (GBCI), the third-party certification body for WELL, to ensure it meets all WELL Certified Silver performance requirements. The project is also pursuing LEED certification for new construction, targeting gold. LEED—Leadership in Energy and Environmental Design—certification is a nationally accepted benchmark for green building construction. Certification indicates that the building is environmentally responsible, profitable and a healthy environment in which to live and work. 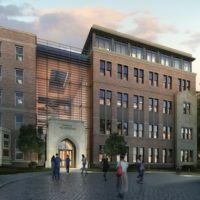 Vanderbilt has 18 LEED-certified structures, including nine certified gold.